While most Canadians are familiar with larger providers like Telus Mobility, Fido Cellular can still offer a very viable alternative for cellular subscribers, particularly those on a tighter budget. The Fido brand in Canada has undergone a number of changes in its history, but it's still around to offer Canadians some of the best cell phone service available in the country. In 1996, Fido hit the Canadian cell phone scene under the company name of Microcell Telecommunications. No one really got to know the company as Microcell, because Fido was the public name that was seen in the marketplace. Despite this, any billing and official documents would display the Microcell name. Contrary to popular belief, Fido was actually the first GSM-based provider in Canada. At the time, other Canadian providers were still using different cellular technologies. At the time of launch, Fido (Microcell) received some developmental funding from T-Mobile International. This partly explains why Fido came to be the only Canadian cell phone service provider to carry the Sidekick line of messaging phones, although these handsets were branded as HipTop phones in Canada. During this time, Fido operated on the 1900MHz band of GSM. In 2004, Microcell Communications was purchased by Rogers Wireless for an estimated $1.4 billion. Fido became a wholly owned subsidiary of Rogers Wireless, but it continued to operate as a separate and independent entity in many ways. The handset offerings, plans, and other company policies remained somewhat independent from parent company Rogers Communications. After the acquisition by Rogers, Fido expanded its network to take advantage of the GSM 850 band offered by Rogers. 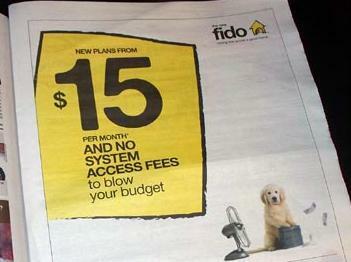 In early November 2008, Fido was "repositioned" with new branding. Instead of simply being known as Fido, the cellular provider came to be known as The New Fido, though "The New" will likely be dropped over time. This rebranding effort brought a number of notable changes, including a complete overhaul of the website, a brand new logo, new pricing plans, and some changes in company policy. The focus also changed for Fido, shifting to the more affordable end of the market. Perhaps the biggest change was the removal of the controversial System Access Fee (SAF). Other major Canadian providers, like Rogers and Bell, charge this in addition to the regular monthly fee. By getting rid of the SAF, the New Fido can better compete against Virgin Mobile and Koodo Mobile. Perhaps in response to the financial downturn in the markets during the later part of 2008, the New Fido changed its monthly plan structure to be more affordable. In this way, Fido currently offers some of the cheapest cell phone rates in Canada. While Fido continues to offer prepaid cell phone service, the focus is on the affordable monthly plans. The cheapest, at just $15 a month, includes 50 anytime minutes (charged by the second) and 50 text messages. There is no E911 fee and no system access fee. All plans include text messaging and there are options for caller ID, voicemail, wireless data, long distance, and other premium services. Given the new budget-minded focus of the New Fido, it is not at all surprising that the cell phones being offered by this provider are not hitting the higher end of the market. With the noted exception of the Apple iPhone, the rest of the Fido lineup consists of entry-level phones that are meant to be as inexpensive as possible. With the signing of a new two-year Fido agreement, the majority of these phones can be had for under $100 with several available for $0 with contract. Basic features on most of these phones still include a camera and possibly a music player though. For users more interested in mid-range and high-end phones, the only option with Fido is to purchase an unlocked GSM phone from a third-party retailer. Fido does not sell premium handsets.